My father was Dzongter Kunzang Nyima also known as Rigdzin Nuden Dorje and my mother was Rintso of the Tug gya family. Among the eight sons of Tragthung Dudjom Lingpa I was recognized by Jamyang Khentse Chokyi Lodru as the incarnation of his second son, Padma Dorje. When I was five years old they enthroned me and at age ten I entered the Dodrubchen Monastery in Golog and began my formal studies. I studied under four great Khenpos from that Monastery such as Khenpo Gangnam, Thrindar, Wangdei Gyangtrul Dondrub Dorje and Washul Khenpo Lodru. I received empowerments from Dzongsar Khentsei Jamyang Chokyi Lodru, Dzogchen Rinpoche Jigdral Changchub Dorje, Shechen Kongtrul Rinpoche Padma Lekpai Lodru and Dodrubchen Tubten Thrinley Palzangpo, Dodrubchen Rigdzin Tenpai Gyaltsen also known as Rigdzin Jalu Dorje, Dungkar Chogtrul Ngedon Gyatso and others. The empowerments I received from them included the Rinchen Terdzod, the thirteen sadhanas of the Kama lineage, the Nyingthig Yabzhi, the Nyingthig Tsapod, the Dupa Do, the eighteen divisions on the meaning of Ah from the mind class, the Vajra Bridge of the expanse class, the Damcho, Dechen lamchog, the three aspects of Kagyad, the Sakya'i kunrig, the generation and completion stage of liberation through hearing, including all the reading transmissions. From my father Dzongter Kunzang Nyima I received the entire transmissions for all of the terma of Tragthung Dudjom Lingpa. Among my father's terma there were sixty volumes for which I received all the empowerments as well as the transmissions. Nevertheless due to the circumstances of the time, at present there are only twenty seven volumes remaining. The Dzogchen upadesha that I received from my father includes the Dzogchen Nanjang and the Chod commentary several times. In addition I received the Nelug Rangjung Tantra and the Sherig Dorje Nonpo Tantra, the six month Togal retreat and the 108 day Togyal practice. I received the tsalung of Vajrakilaya and in particular from my father I received the extremely secret Dzogchen transmission that he was only allowed to give three times during his life as a mandate from his root Guru. From my father I also received his terma Dzogchen teachings called Directly Seeing the Fundamental Nature and the method of placement called Blazing Luminosity. Now concerning my own activities of propagating these lineages, I have given the entire empowerments of Tragthung Dudjom Lingpa's terma on four occasions. One time was in Serta Golog Tibet, one time by the invitation of Chadral Sangye Dorje in Siliguri India, one time in Landow China, and one time at the banks of Lake Kokonor. I have given the entire empowerments of my father's terma four times as well. Once in Serta, again in Landow, in Parping Nepal and at Lake Kokonor. In Parping the empowerments were given at the request of Chadral Rinpoche which included the Dudjom Vajrakilaya, Phurba Deshek Nyingpo and Troma Nagmo. 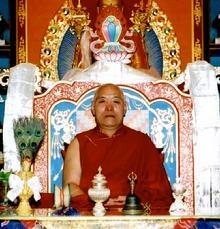 I also gave the transmissions for Dzogchen Nangjang and the Nelug Rangjung. In Chadral Rinpoche's retreat I gave the empowerments for Yumka Dechen Gyalmo and Lhadrub Thigley Gyachen of the Longchen Nyingthig tradition. At his retreat in Gotabhari Nepal I gave the empowerments for the three roots of the Nyingthig and also Lhadrub Thigley Gyachen. Now to mention who some of the recipients were during these transmissions, the principal ones were the third Dudjom Rinpoche, Ahpang Chogtrul Tsepo, Dungkar Chogtrul Chokyi Gyaltsan, Lama Padma Tumpo, Chogtrul Hungkar Dorje, Chogtrul Kabu kye, Sogtrul, Zhalpa Rinpoche, Wanggyal, Chogtrul Odzer, Chogtrul Kunzang Nyima, Jamyang Tragpa, Chogtrul Jamyang Trodral, Terton Tulku Drongdzong, Terton Tulku Thrinley Tendzin, Tulku Tubten Rigdzin and many others. My main project of this life has been to create an opera performing the deeds of the bodhisattvas as requested of me by the fourth Dodrubchen Rinpoche, Rigdzin Jalu Dorje. At present I am also making an opera for the Horse Race of the Epic of King Gesar of Ling as well as the biography of Prince Drimed Kundun. These operas are now available in DVD format and have pleased many teachers.